Most Web producers will tell you to always test the content you create for a site in multiple browsers. When you do, you almost always find differences in the way your page appears. 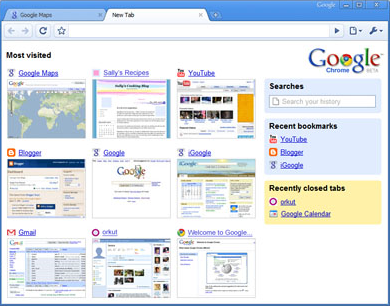 Now, Google has launched a new browser called Chrome. Among other features, Chrome’s navigation bar — the space where you type an Internet address — will serve a dual purpose. Users can either enter an address into the space or a search request that will be processed through their search engine of choice. The Associated Press reports that Google’s goal is to dominate the Web search arena in an even bigger way (64% of searches are already run through Google), plus Chrome is also a direct attack on Microsoft’s Internet Explorer, which the AP says is used by about three-fourths of the world’s Web surfers. To date, the Mozilla Foundation’s Firefox has been IE’s big competitor. Until they release the Mac version, it will not be on my download list.